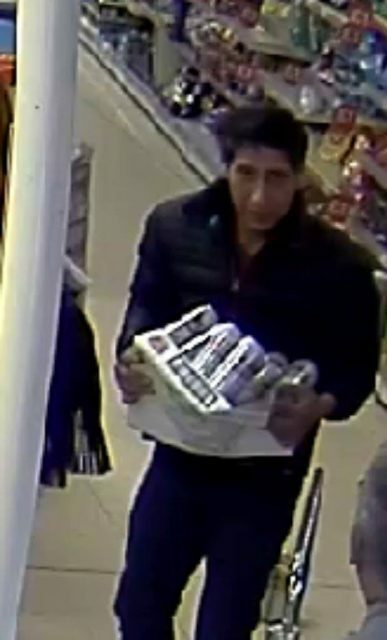 Just when you thought the case was closed, the Ross Geller lookalike ‘beer thief’ who set social media users in a spin earlier this year has failed to appear in court after he was charged with stealing items from a restaurant in Blackpool. Abdulah Husseni, 36, of Spencer Road, Slough, was due in Blackpool Magistrates’ Court yesterday (18 December), but failed to make an appearance. Husseni has been accused of stealing items including a coat, phone and a wallet from the Mr Basrai’s World Cuisines buffet restaurant in Blackpool. A district judge in Blackpool has issued a warrant for his arrest after Husseni failed to both appear in court and to answer his court summons which were posted to him. A Facebook post by Blackpool Police, which has since been deleted, went viral attracting hundreds of thousands of comments and shares, with users commenting that the man bore a striking resemblance to the character Ross Geller in the US TV sitcom Friends, played by actor David Schwimmer. Seeing the funny side, the actor himself responded to the appeal in a spoof video, insisting that “it wasn’t me”. He wrote on social media: “Officers, I swear it wasn’t me. As you can see, I was in New York. “To the hardworking Blackpool Police, good luck with the investigation”.